FILE - A Haitian family that did not want to be identified, living in the U.S. with Temporary Protected Status (TPS), speaks to members of the media in Miami, May 22, 2017. After years of being shielded from deportation from the United States while their country recovers from a devastating 2010 earthquake, tens of thousands of Haitians will lose that security status. "It was assessed overall that the extraordinary but temporary conditions that served as the basis of Haiti's most recent designation has sufficiently improved such that they no longer prevent nationals of Haiti from returning safely," a senior Trump administration official said during a briefing. Temporary Protected Status, or TPS, will be revoked for almost 60,000 Haitians living and working in the U.S. The announcement came in advance of a Thursday deadline for the decision to be made regarding Haiti's TPS benefits. The protection will expire July 22, 2019, giving Haitians living in the U.S. an 18-month window to go back to their homeland or legalize their status in the United States. Haitians with TPS status have a 60-day window to submit an application to renew their status until the 2019 deadline. When that time comes, they will revert to their prior immigration status. Administration officials said Monday evening that Haitians with TPS would not be subject to deportation proceedings until the deadline. In making the announcement, officials said that conditions on the ground in Haiti resulting from the 2010 earthquake that first let to the establishment of TPS "no longer exist." However, advocates argue that Haiti is in no condition to handle the influx, seven years after the 7.0-magnitude quake created billions of dollars in damages, and left 300,000 dead, 1.5 million injured and an equal number internally displaced. The country was also recently hit by Hurricane Matthew, which created $2.8 billion in damages last year, followed by damage from hurricanes Irma and Maria. Haiti also is battling a deadly cholera epidemic. Last week, the Office of Civil Protection confirmed that at least five people had died and 10,000 homes were flooded after days of rain. FILE - Rep. Ileana Ros-Lehtinen, R-Fla., speaks during a news conference on Capitol Hill in Washington, Nov. 9, 2017. 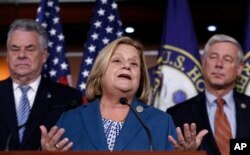 Representative Ileana Ros-Lehtinen, a Republican whose South Florida district is home to many Haitians, denounced the decision on Twitter. "I traveled to Haiti after the earthquake in 2010 and after hurricane Matthew in 2016," she tweeted. "So I can personally attest that Haiti is not prepared to take back nearly 60,000 TPS recipients under these difficult and harsh conditions." Advocates and recipients are also pushing for Congress to provide a permanent solution for Haitians who have lived in the United States for nearly a decade. "My community is tired of living 18 months at a time," Lys Isma, who came to the United States from Haiti with her family when she was nine months old, told reporters Tuesday. "We need a permanent solution." In May, then-Department of Homeland Security Secretary John Kelly extended TPS for Haitians for six months, not the one-year extension advocated by Haiti's government. Kelly said at the time that the extension "should allow Haitian TPS recipients living in the United States time to attain travel documents and make other necessary arrangements for their ultimate departure from the United States, and should also provide the Haitian government with the time it needs to prepare for the future repatriation of all current TPS recipients." Haiti's ambassador to the United States, Paul Altidor, told VOA at the time that the Caribbean country, while glad to welcome back "our brothers and sisters," was not ready to absorb tens of thousands of returnees "overnight." 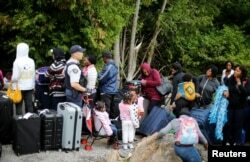 Fear of deportation sparked an exodus of at least several thousand Haitian immigrants this summer, who illegally crossed the Canadian border seeking asylum in the French-speaking province of Quebec. FILE - A Royal Canadian Mounted Police officer announces to a group of asylum seekers that identified themselves as from Haiti, that they will be crossing illegally into Canada as they wait in line to to enter at the U.S.-Canada border in Champlain, New York, Aug. 7, 2017. According to a recent study by the Center for Migration Studies, most Haitians on TPS have been living in the United States for 13 years and have 27,000 U.S.-citizen children among them. More than 80 percent are employed, while 6,200 have mortgages. Haitian immigrant communities primarily are in South Florida, New York, New Jersey and eastern Massachusetts. TPS was ended for Sudan last month. On January 8, the administration will have to make a decision about more than 130,000 TPS holders from El Salvador. Earlier this month, in terminating the TPS program for thousands of Nicaraguans who fled to the U.S. after Hurricane Mitch in 1998, and deferring a decision on 57,000 similarly affected Hondurans until July, the acting secretary of homeland security, Elaine Duke, acknowledged the "difficulties" families would face and called on Congress to find a permanent solution. VOA Creole Service contributed to this report.